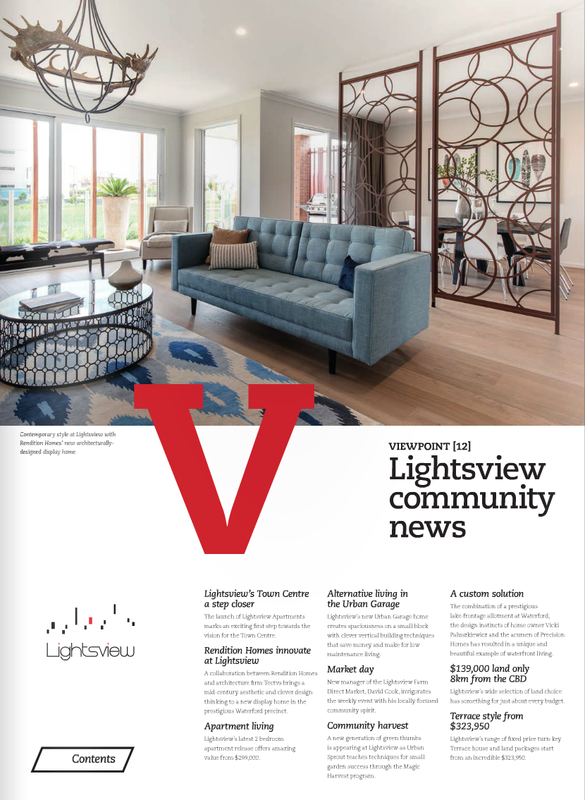 Architectural creativity and a keen interest in liveability come together in Rendition Homes' new waterfront display home at Lightsview. 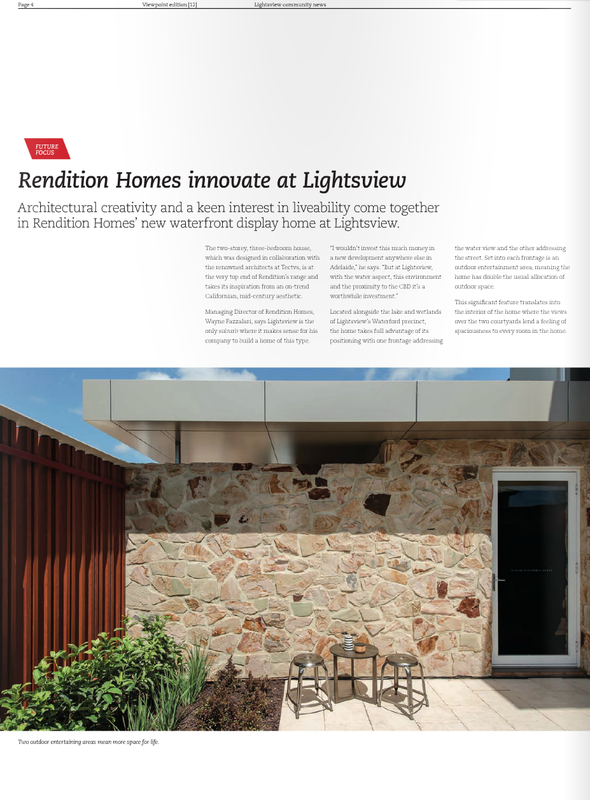 The two-storey, three - bedroom house, which was designed in collaboration with the renowned architects at Tectvs, is at the very top end of Rendition's range and takes its inspiration from an on-trend Californian, mid-century aesthetic. 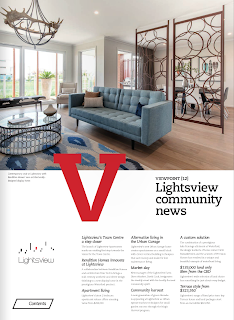 Managing Director of Rendition Homes, Wayne Fazzalari, says Lightsview is the only suburb where it makes sense for his company to build a home of this type. "I wouldn't invest this much money in a new development anywhere else in Adelaide", he says. "But in Lightsview, with the water aspect, this environment and the proximity to the CBD its a worthwhile investment." Located alongside the lake and wetlands of Lightsview's Waterford percent, the home takes full advantage of it's positioning with one frontage addressing the water view and the other addressing the street. Set into each frontage is an outdoor entertainment area, meaning the home has double the usual allocation of outdoor space. This significant feature translates into the interior of the home where the views over the two courtyards lend a feeling of spaciousness to every room in the home. "As soon as you walk in the front door you see straight through to the back outdoor area and then your view just keeps going on out over the water. It's seamless, "says Wayne. "because of the nature of the house - with the double frontage and the reserve to the rear - everywhere you look you see out. You're always looking through to something else." A cohesive material and interior-design palette uses natural textures juxtaposed with industrial fittings to complement the connection the home has to its external environment. 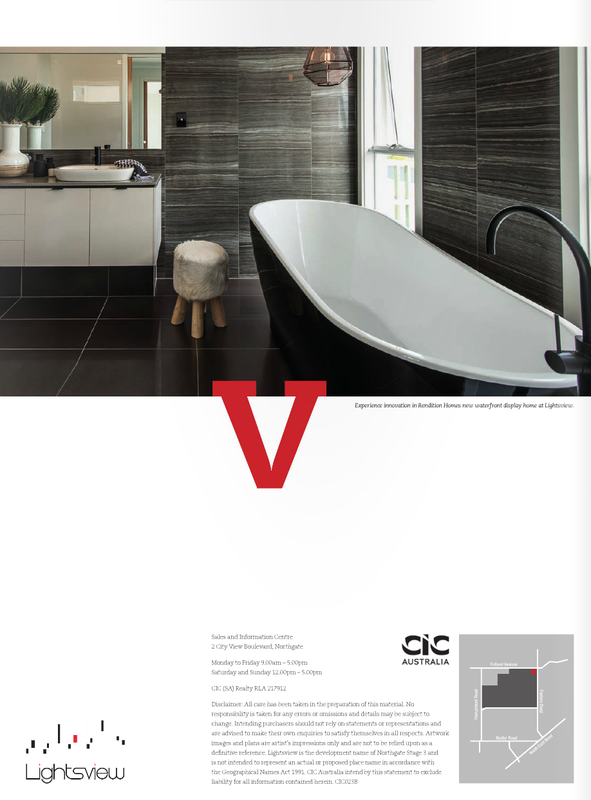 The master bedroom's ensuite is a particularly strong example of this styling at work. The black Caroma bath is a leading element in a room that also includes feature tiles, matte black taper and pendant lights. Wayne says the home will serve as an example to visitors of Rendition Homes' ability to be innovative and practical at the same time, whilst designing a home that suits a person's specific needs. "Buying a house is an emotional thing," he says. 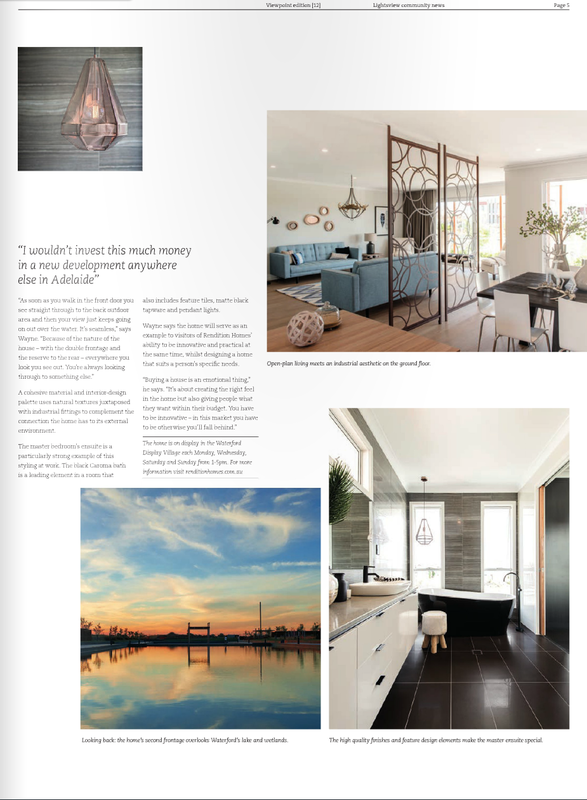 "It's about creating the right feel in the home but also giving people what they want within their budget - in this market you have to be otherwise you'll fall behind."